GingerPeach has lost a lot of strength in her hind end. 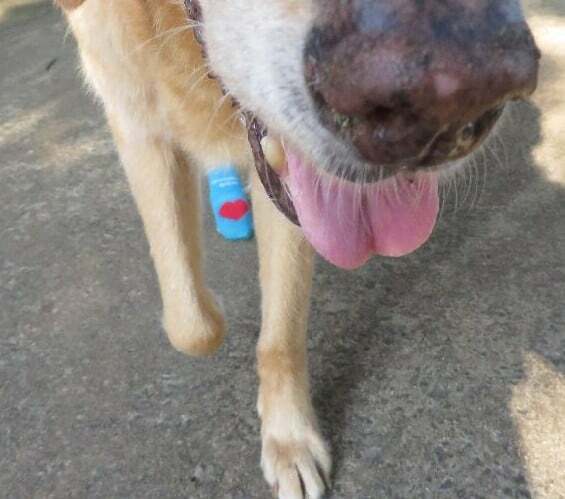 She has experienced ataxia for many years due to epileptic seizures and anti-seizure meds but her hind end was still strong and she moved around quite well. That’s all changed now due to the addition of hip and joint issues of arthritis & aging (her age is approximately 12-13 years), and weakness & muscle loss due to current medical issues. As a result, she is now experiencing loss of traction on smooth surfaces – tile, hardwood, smooth cement, etc. Once GP is in a down position on a smooth floor, either by choice or because she has slipped 🙁 she has a hard time getting back on her feet. On good days, she is able to get up on her own, though it sometimes takes effort. Other days she is unable to get up by herself despite great effort and exertion and needs assistance to stand up. She also sometimes slips while standing, walking, or turning. 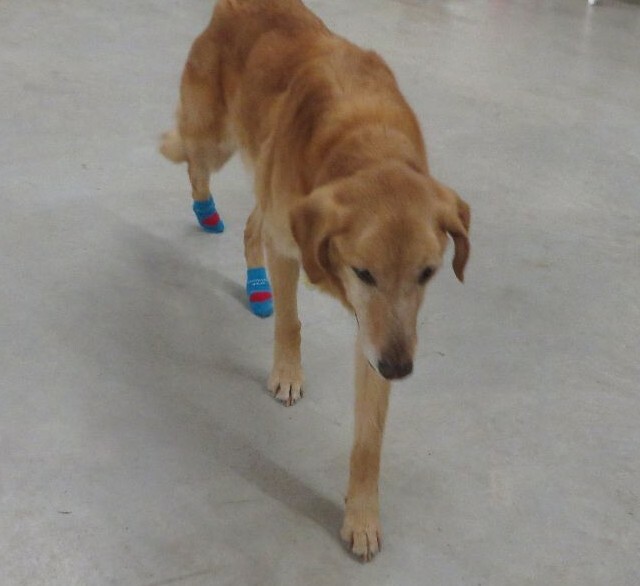 As a starting point for addressing traction, I researched non-slip socks & boots for dogs and found Power Paws by Woodrow Wear. 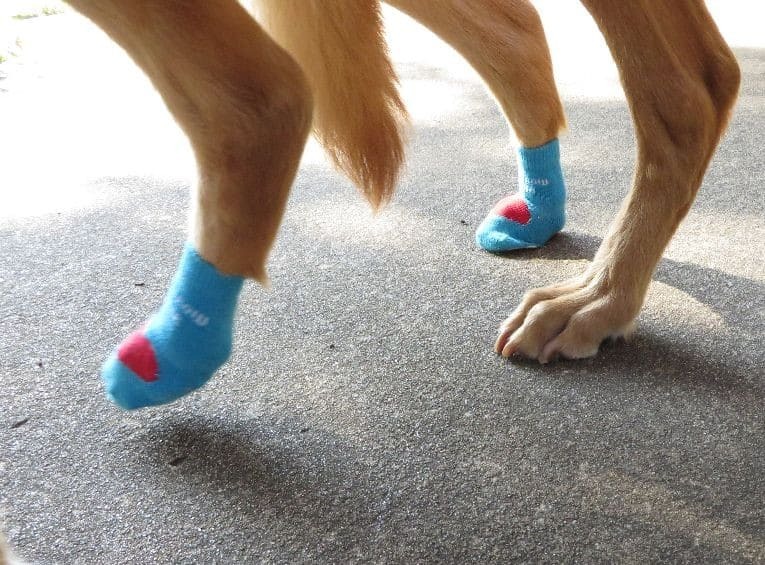 From their website, “Power Paws non-slip dog socks help keep dogs from slipping on floors, give traction to senior dogs and dogs with hip dysplasia or arthritis, protect paws from heat, snow or allergens and help keep paws wounds clean.” Exactly what we needed. I decided to try them for GingerPeach. 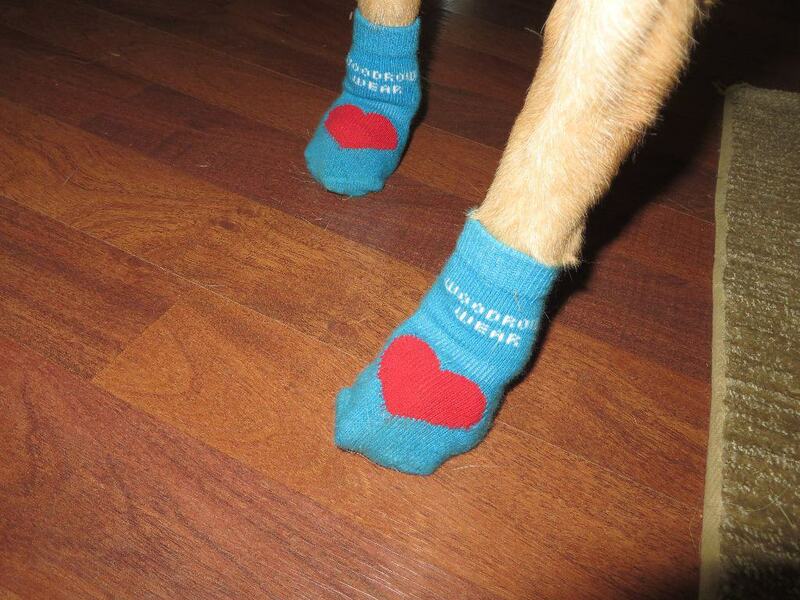 Her socks arrived 2 days ago and…so far so good! When I first saw them in the package, I thought they might be too small. But, just as the folks at Woodrow Wear state on their Size Guide page, “Power Paws look small but stretch a lot.” I put them on GingerPeach, Medium is a perfect fit for her sweet little feet! She is standing up with far less effort (!) and walks around in them beautifully. She has improved balance, traction and is sure-footed. 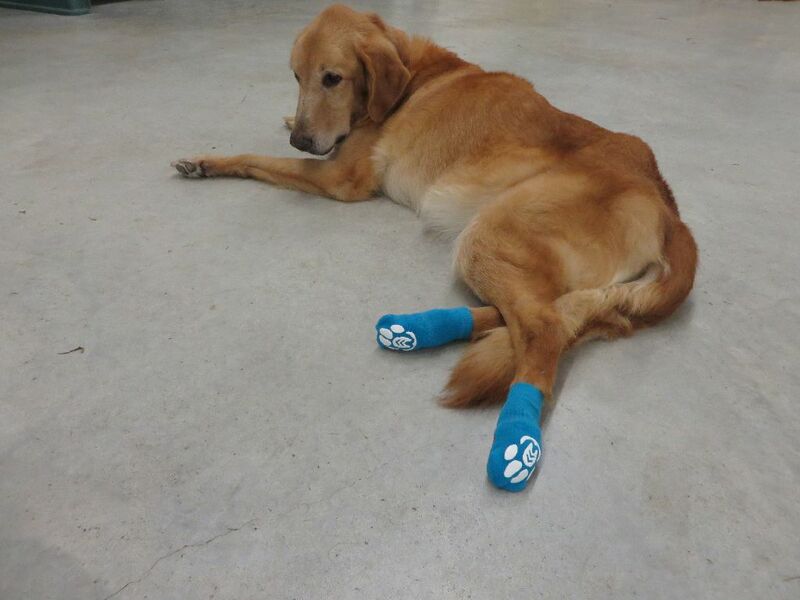 She is pretty darn happy wearing her socks – and pretty darn cute, too! SUCCESS! 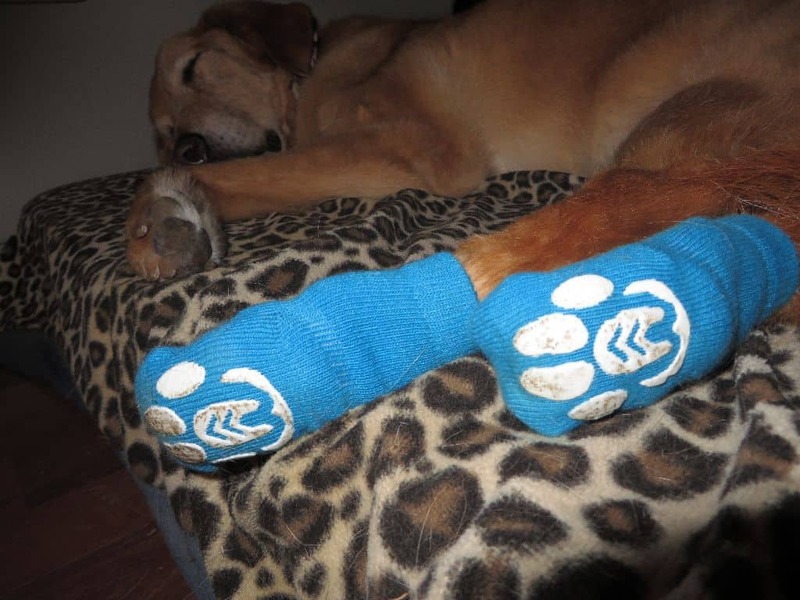 In addition to giving GP much needed traction and improved safety, these wonderful socks help her conserve energy! 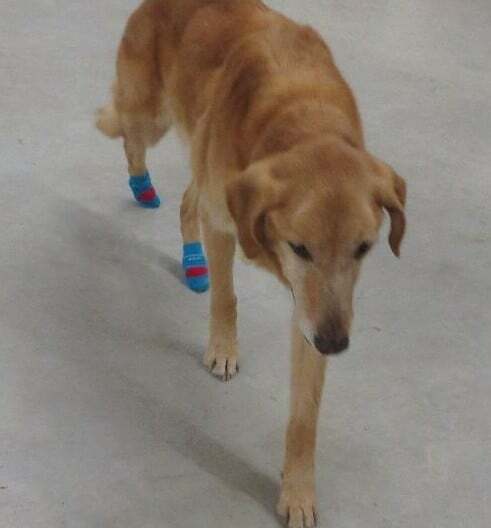 She now needs less energy for stability while walking and standing on smooth floors, and less energy to get up from a down. That’s very good because she needs that precious energy for other things in her day. 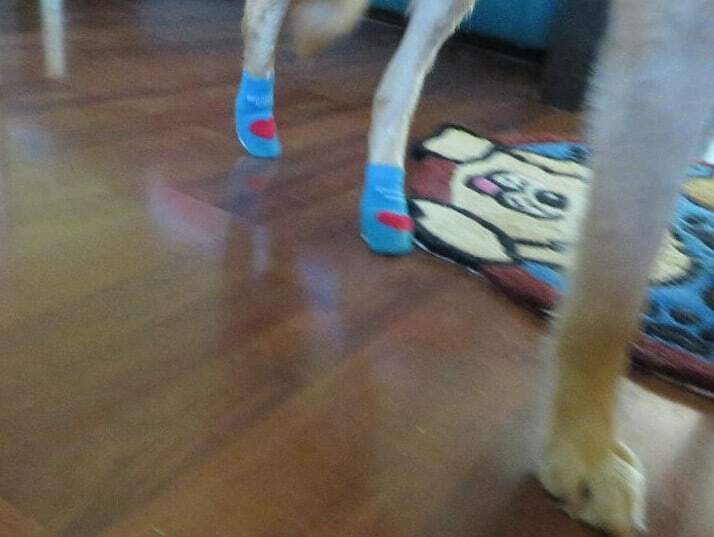 These wonderful socks also help maintain her independence and confidence. MORE SUCCESS! 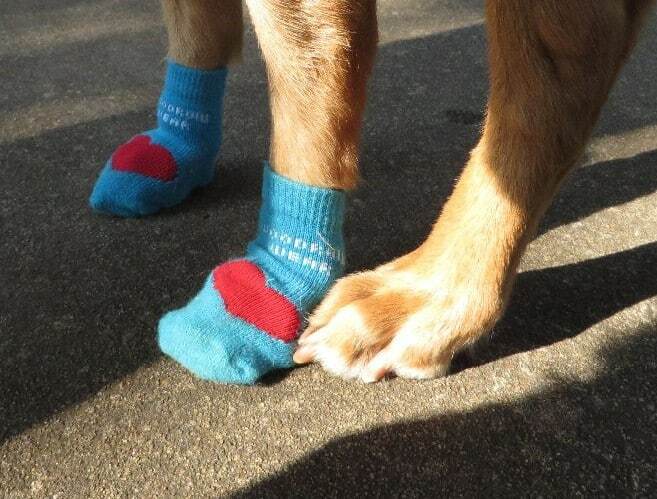 Right now GP wears the socks on her hind paws only – her front half is relatively strong and coordinated. When we go outside for lengths of time and on walks I have been taking them off since she doesn’t need them on grass or other textured surfaces. 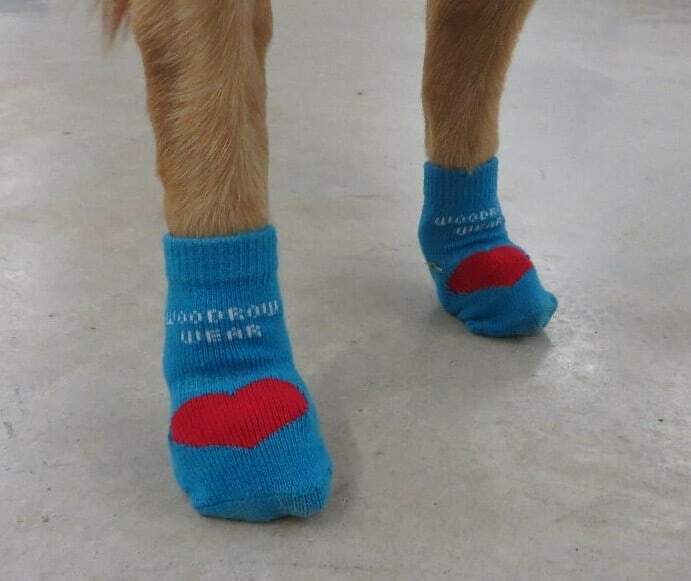 (Yes, the socks are machine washable, details on company’s website.) I’ve also been removing them on occasion indoors when she’s relaxing, napping, etc., – fine tuning this and a few other variables. We’re just on Day 3 of life with Power Paws but already GingerPeach & I give them a HUGE PAW UP! 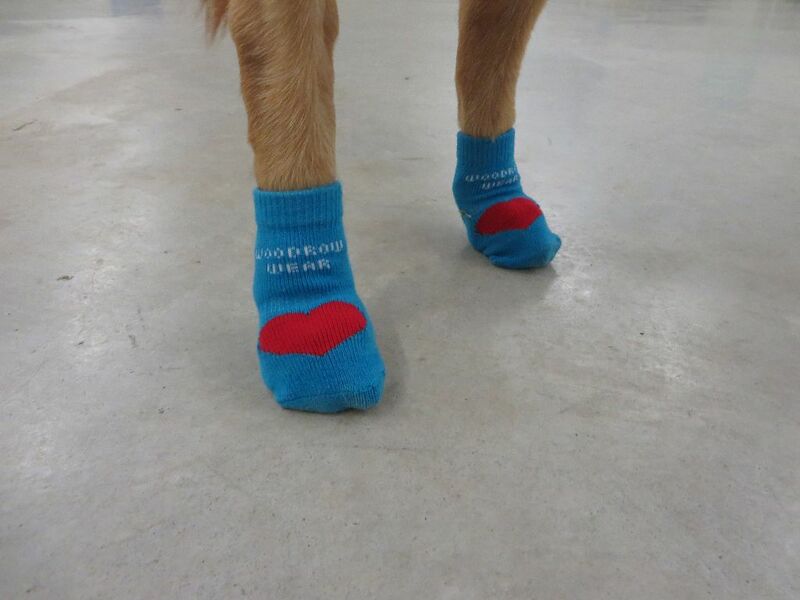 No more slip slidin’ away for GP who is already reaping the benefits of these wonderful socks. “Thank You!” to the folks at Woodrow Wear! 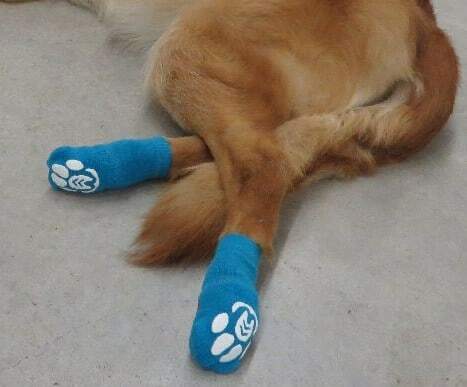 If your dog is slipping, unstable on his feet, has joint issues, is senior and would benefit from increased traction, or any of the other uses listed at their website, you might try these socks. 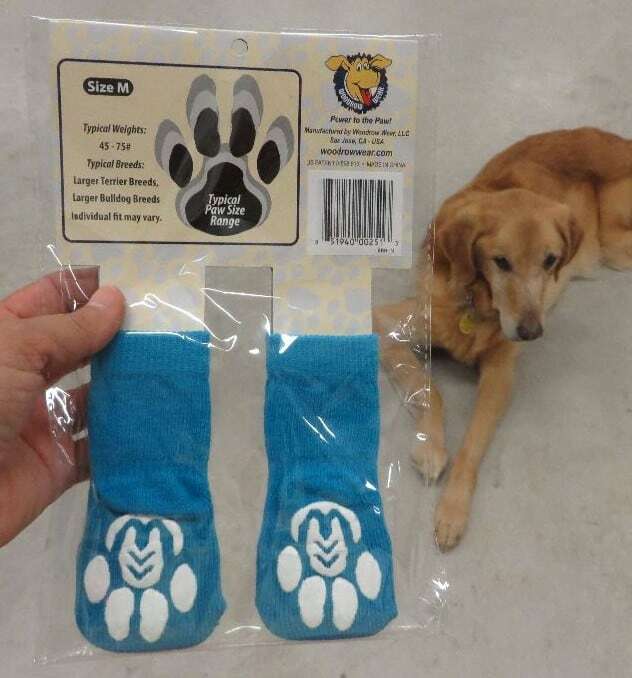 You can order Power Paws at Woodrow Wear’s website. Current prices are $14.99 (clearance), $19.99 Original, and $24.99 (reinforced toe and styles with bling). 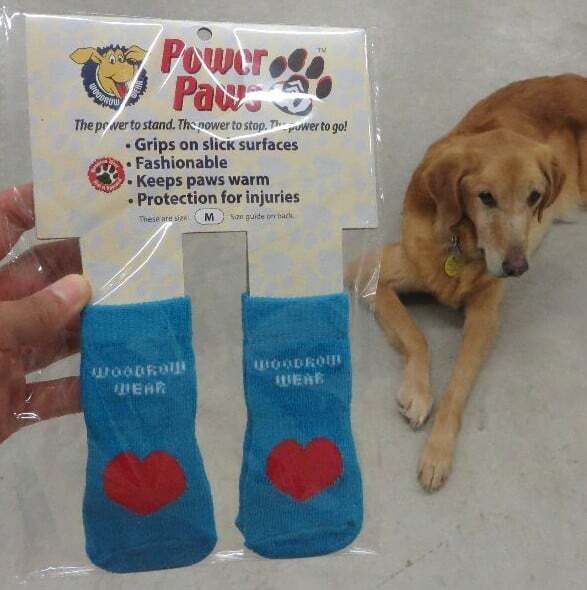 I ordered this first pair while shopping at a website called Senior Pet Products and paid $25 total ($19.99 for the socks plus shipping/handling). *Much is being done to help GingerPeach and the other senior Posse dogs as we journey through this difficult time of health issues and many life changes. More on that to come in other posts. "Those who lack a courage will always find a philosophy to justify it"